Drying tulips in silica gel is one of the most effective ways to preserve the beauty of the colorful springtime blooms. In spite of its name, silica gel isn’t a gel, but a granular substance that resembles sugar. As the silica gel rapidly absorbs moisture from the tulips, the size, color and shape of the blooms are unaffected. In a week or less, you’ll have perfect tulips that can be used in dried flower bouquets, wreaths or other craft projects. Start with high quality tulips that are at the peak of their beauty and haven’t begun to wilt. If the tulips are from your garden, harvest the tulips on a sunny day after the morning dew has evaporated. Wet tulips will be more difficult to dry. Remove the foliage from the tulips, then trim the stem to about 1 to 1-and-1/2 inches in length. Spread 2 to 3 inches of silica gel in the bottom of an airtight container. Place the tulips in the silica gel with the stems down. Place additional silica gel around the bloom a little at a time, shaking the container gently until the blooms are completely covered. The tulips shouldn’t be mashed, but should be nestled in the gel so the shape of the flower is retained. Add an additional inch of silica gel on top. Cover the container securely, then place the container in a dark, dry, warm room. Check the tulips in three to five days, then check every day until the tulips are dry. The length of time will depend on the size of the blooms, but the tulips should be dry in a week or less. Dry tulips will be stiff and papery. Remove the dried tulips carefully from the silica gel, as the blooms will be fragile. 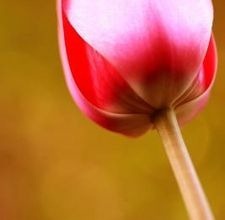 Cup your hand under the bloom, then lift the tulip gently from the gel. Remove any excess gel with a soft artist’s paintbrush. Cut a piece of 20- to 24-gauge floral wire to the desired stem length. Push the wire carefully through the bottom of the tulips, extending the wire about an inch above the bloom. Bend the end of the wire to a hook shape, then pull the hook down where it will be hidden in the middle of the tulip. Cover the wire stems with green floral tape. Place the dried tulips in a vase, or use as desired.